M. Safwan Badr, M.D., M.B.A., has been appointed chair of the Wayne State University School of Medicine Department of Internal Medicine. Jack D. Sobel, M.D., dean of the School of Medicine, announced the appointment, effective immediately, on Feb. 13. "Dr. Badr is invested in outstanding medical education," Dean Sobel said. "He was the founding director of the Wayne State University Sleep Medicine Fellowship program, and he teaches and mentors students in multiple departments across the school of medicine." Dr. Badr replaces Basim Dubaybo, M.D., who served as interim chair and resigned to accept a position with Providence Hospital. 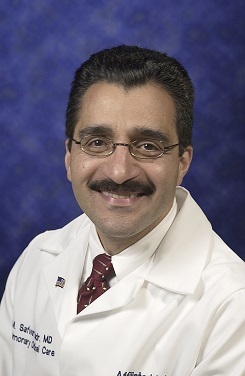 A professor of Internal Medicine, Physiology and Biomedical Engineering, Dr. Badr is chief of the WSU Division of Pulmonary, Allergy, Critical Care and Sleep Medicine, and a staff physician at the John D. Dingell VA Medical Center. He serves as the chief medical officer of the Wayne State University Physician Group. He served as associate chair of the Department of Internal Medicine from 2004 to 2008, and as the chief medical officer for the Detroit Medical Center from 2008 to 2010. Dr. Badr is an internationally known sleep disorders researcher and research mentor with current funding from the U.S. Department of Veterans Affairs, Department of Defense and National Institutes of Health. He has mentored numerous trainees and junior faculty members who have launched successful academic careers. A graduate of Damascus University Medical School in Syria, he completed a residency in Internal Medicine at Cook County Hospital in Chicago, followed by clinical and research fellowships in Pulmonary, Critical Care and Sleep Medicine at the University of Wisconsin, Madison. He also completed a master's of Business Administration degree at the University of Tennessee. Dr. Badr has served on multiple national and international medical societies, including on the boards of directors of the American Thoracic Society and the American Academy of Sleep Medicine. He was the president of the AASM from 2013 to 2014. He is a founding member of the American Board of Administrative Medicine.